This photo shows the diamond dust display near Mátraszentimre skiing resort in Hungary on 30th December and was taken by photographer Zsuzsanna Tóth. 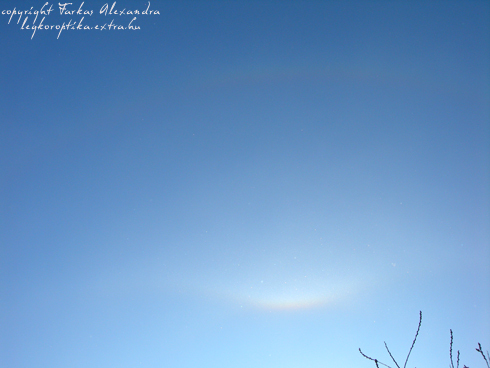 The snow guns were on, and the halo appeared in the early afternoon and lasted about an hour. The display was the best at around 2 p.m. Then the 22° halo, parhelia and upper tangent arc were accompanied by a Moilanen arc. As indicated by the bright parhelia and a less conspicuous upper tangent arc, the display must have been dominated by plate crystals. Unfortunatelly, however, there was no one around who would have collected samples, so the mystery remains unsolved. Natural diamond dust is very rare in Hungary, due to our temperate continental climate. But this winter has so far been much colder than the average ones, and it has resulted in a pretty diamond dust display without the assistance of any snow guns on 3rd January in Mogyoród. Alexandra Farkas took this picture of UTA, CZA, and supralateral arc. 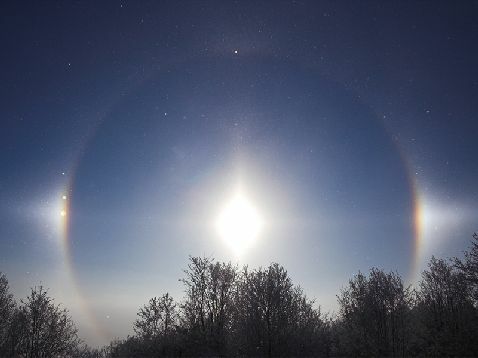 The halos don't show anything extraordinary, still it was a unique sight in Hungarian winter. The original post in Hungarian below the link. I would rather say "the first Hungarian language publication of the photo" to avoid misunderstanding. That article on hirek.csillagaszat.hu is of course NOT THE ORIGINAL of this post. The publication of the photo is after personal correspondence with and permission of the author!